Imagine my surprise when I realized I owned a few more bottles of the 1989 Monprivato than I thought as I was rummaging through the cellar looking for something to serve for dinner. The choice was made for us, it seemed. Over the years I have been fortunate to taste and drink the 1989 many times. This was one of the very best bottles I have ever come across. An absolutely stunning, captivating wine, the 1989 Barolo Monprivato is dazzling from the moment it is served. The color alone – that translucent ruby of fine, aged Nebbiolo – is the first sign we are in for a real treat. That early promise is more than realized as the first scents waft from the glass. Rose petal, hard candy, red berries, cinnamon and herbs grace the palate in a seemingly endless kaleidoscope of aromas and flavors. The tannins are silky, sweet and almost impossibly creamy, lending an aura of total finesse. With time, the 1989 continues to grow and flesh out as it reveals the various dimensions of its multi-faceted personality. 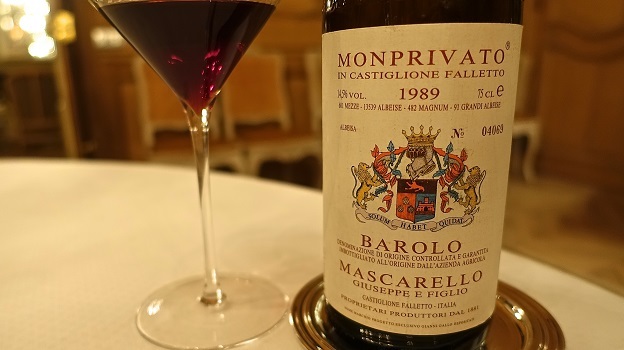 The 1989 Barolo Monprivato is one of Mauro Mascarello’s best-ever wines, and also one of the greatest wines of an iconic Barolo vintage that even today provides incredible visceral thrill. It simply does not get much better than this. I am often asked: if I could own one vineyard in Piedmont, which would it be? Monprivato is often top of mind. 98/Drinking window: 2015-2035.